"There was a time when being called a shoemaker was the ultimate kitchen insult. It meant that your cooking skills were so weak, the cobbler down the street could have come into the kitchen and done just as well. 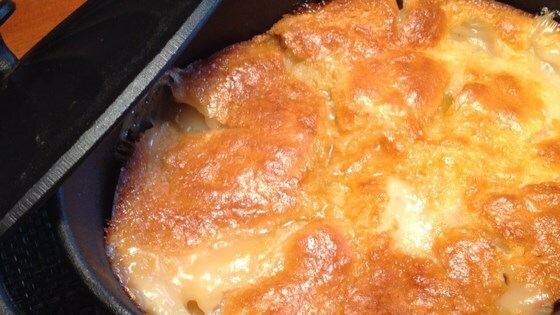 This beautiful peach cobbler recipe is so easy, any shoemaker could master it." Combine peaches, Chinese five-spice powder, and lemon zest in a bowl. Combine sugar and self-rising flour in a large bowl. Pour in milk; whisk to form a smooth batter. Pour melted butter into a Dutch oven. Pour batter over the melted butter. Gently place peaches and syrup on top of batter. As the cobbler bakes, they will sink down into the batter. Bake until syrup is bubbling and crust has risen and is golden brown, about 50 minutes. See how to make the perfect summer pie with a gorgeous lattice top. Canned peaches can be substituted for the fresh peaches in this recipe. If using canned peaches, use the syrup in the can instead of making one with sugar and water. We didn't like the Chinese five spice powder flavor. It was just an off taste to us.